Nashville, Tenn. (April 6, 2016) – It’s only appropriate that the “Hardest Working Man in Country Music” would appear on the cover of The Man Mag. 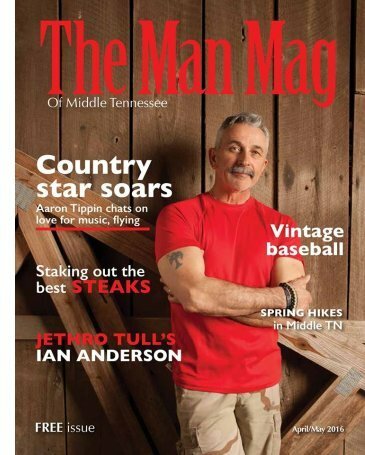 Platinum-selling country star Aaron Tippin, who is celebrating 25 years in the music business, has landed the cover of the April/May issue of the magazine. The spring 2016 edition of the publication features an in-depth interview with Tippin– delving into his love of music, family, fitness, flying airplanes and more. The latest issue of The Man Mag is on newsstands now. Read the full interview online at www.themanmagonline.com. Tippin’s fame was launched in 1990 with the release of his uncompromising single, “You’ve Got to Stand For Something.” He followed with other major hits including “Where the Stars and Stripes and the Eagle Fly,” “There Ain’t Nothing Wrong with the Radio” and “Kiss This.” In celebration of his 25th anniversary, Tippin has released Aaron Tippin 25. The two-disc album is a collection of 25 songs that includes 10 freshly recorded versions of his biggest career hits, as well as 15 brand new songs. The album is available exclusively at aarontippin.com. In addition, Tippin has teamed with Stonehaus Winery to release a commemorative bottle of blackberry wine, “Aaron Tippin Country Jam.” The new barrel-select wine is available in select liquor stores and Stonehaus Winery.